You will be remembered for many years to come when this stainless steel oil/vinegar dispenser is used. 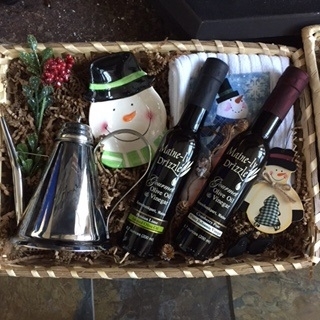 The basket also includes a dipping dish, kitchen towel and 2 6.7 oz products Persian Lime Olive Oil and Cranberry Pear White Balsamic Vinegar. This basket also includes decorative items seasonally appropriate.